Jonaliese, Sauda and Daphe found a direction for their lives at FCA´s vocational school in Uganda. Thanks to their exceptional motivation, the young graduates from FCA´s school face no difficulties in finding work. If someone had asked 20-year-old Jonaliese Karsugho where she will be in five years’ time, she would have hardly thought that she would be instructing a final project in metalwork at a Ugandan refugee settlement. 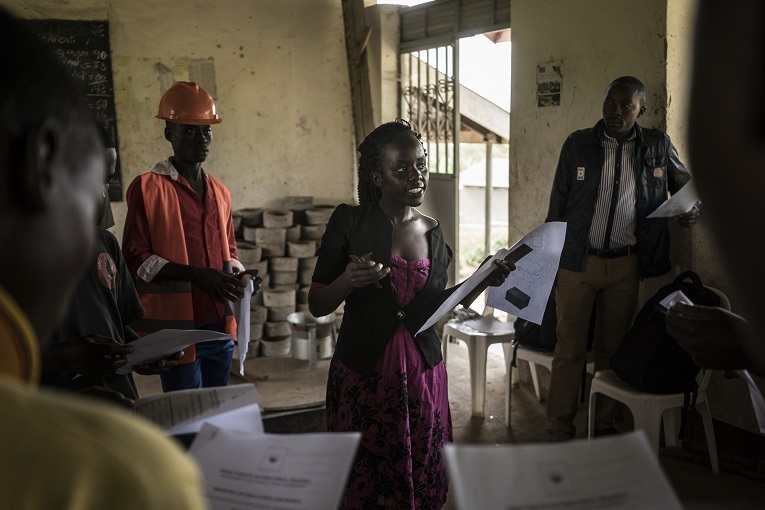 But here she is at the age of 25, in the middle of a metal workshop, dressed in a pink dress, going over the instructions of the final project in her native language of Kinyabwisha, for a group of young men. Jonaliese’s future plans were altered by the war. She escaped the violence in Congo to Uganda with her sister in 2014. Rebels killed Jonaliese’s parents. Amidst the chaos, her third sister disappeared. To this day, Jonaliese does not know whether her sister is still alive. At Rwamwanja refugee settlement, Jonaliese supported herself and her younger sister first by cultivating land. One day, she saw an advertisement for a course organised by Finn Church Aid (FCA). After taking the farming course, the following year Jonaliese was accepted as an assistance leader for a metalwork course. As a result, she is now watching attentively as 15 students start hammering a sheet of metal into a toolbox. Soon the air is filled with a horrific sound of banging metal hammers. We have to leave the classroom. Rwamwanja refugee settlement was founded in the 1960’s to settle refugees of the Rwandan genocide. The settlement was closed for a few years, until unrest in Congo flared again in 2012. FCA founded a vocational school in the area in 2015. Most of the young people participating in the vocational training have lived at the camp for 3-5 years. Out of the young people who have completed the training, an impressive 73 percent have either found employment or started their own business. 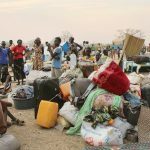 There are about 63,000 refugees living at Rwamwanja refugee settlement, most of whom having escaped the civil war in the neighbouring Congo. One of the biggest problems of the settlement, with a population roughly the size of the city of Vaasa, has been youth unemployment. ”When young people had nothing to do, they would just drink and gamble,” says FCA project coordinator Caphas Mugabi. FCA started working at Rwamwanja three years ago by first mapping which professions the young people should be trained for, in order for them to have good chances at finding work. The first courses started in May 2015, training the youth to be construction workers, engine repairers, tailors, cooks, metalworkers, and barbers. 250 students are selected for the six-month long training twice a year. There are more applicants than there are openings, and the students are selected based on applications and interviews. Both refugees and young Ugandans are admitted into the training. ”We do not care about previous studies, since many have been forced out of school due to the war. What we care most about is motivation. 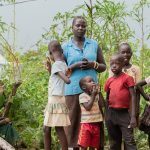 Many of the young people are in a desperate need for training and work, for example in order to support younger siblings after their parents have died,” says Mugabi. Finding work is the main goal of the training. The studies include an internship, learning about finding a job and entrepreneur skills. The results have been excellent. A total of 73 percent of the graduates have either found employment or started their own business. ”We feel as if our work here truly changes the lives of these young people,” says Mugabi. The clamour of the metal workshop eases a little as we cross the yard to another classroom. Here the air is filled with the buzzing of sewing machines, as some twenty young people are sewing the seams of skirts as part of their final project. 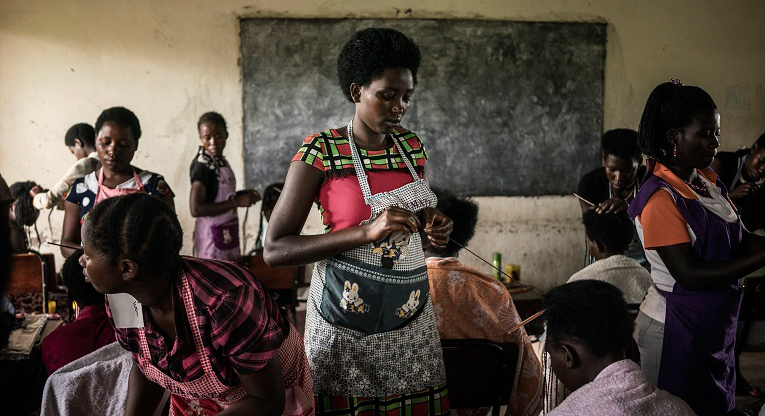 Sauda Tusingwire, 21, looks like a professional using her sewing machine. It is hard to believe that she first tried using a sewing machine only six months ago. The elegant dress Tusingwire is wearing is also designed and sewn by her. ”Although I was interested in becoming a tailor and I had lots of ideas for clothes, I didn’t know anything before starting this school,” says Sauda. 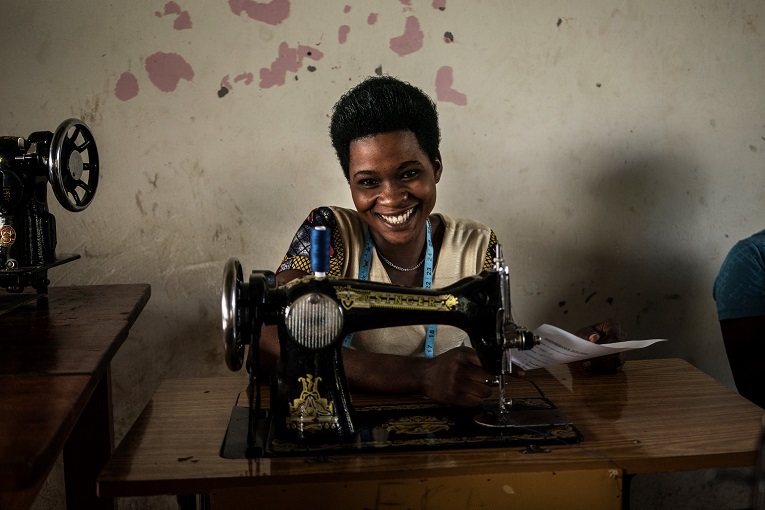 In addition to sewing her own clothes, Sauda has sewn clothes for her twelve siblings. For the children of a single father, the clothes sewn by their sister have been very welcome. ”However, the most important thing to me has been that I have been able to make money by selling the clothes I have made at school. My dream is to start a big business,” says Sauda. Young people from harsh circumstances need additional support. They are assisted by FCA´s student counsellor Olivia Nazzawi. She visits the students and graduates regularly. After graduation, Nazzawi’s task is to help them find employment or start their own business. ”My job is to encourage and support them. At a refugee camp, it is easy for people to become passive and give up. It is then my task to say that you have no choice. You have to work,” says Nazzawi. For example, graduates of farming studies are provided with a plot of land and farming equipment by the school. They can sell their crop at the marketplace or at a store and earn a living. The employment prospects are brightest for construction workers, since there is a great deal of construction going on in the fast-growing area. At the start of their career, graduates of catering studies may be offered a job at a small restaurant founded by FCA, and in addition, many have found employment at other restaurants in the area. 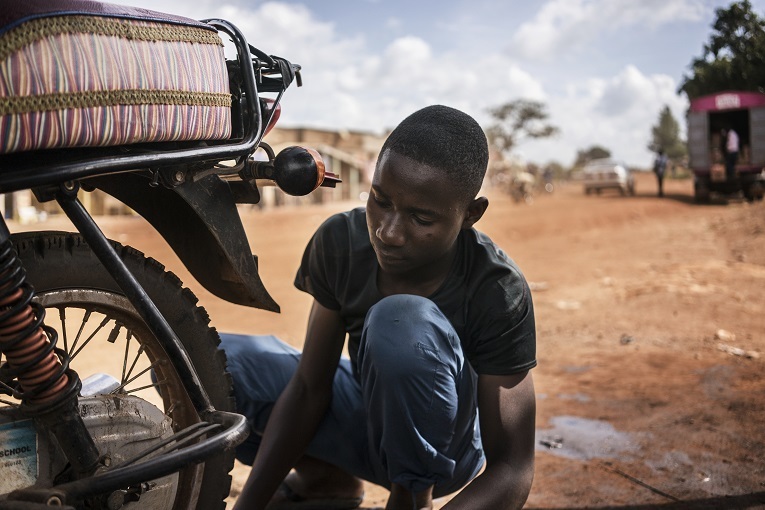 Aside from the restaurant, FCA has founded a repair shop in which young people can gain work experience and earn money. Last year, the most popular courses were those for hairdressers and tailors. Daphe Nantesa, 17, weighed between the two courses after she heard about the school from a teacher visiting her village. Daphe applied and was selected for hairdresser studies, which turned out to be a good choice for her. Daphe has calculated that for one customer, she needs to buy hair salon materials for 10,000 Ugandan shillings (which equals roughly 3 euros). She can then charge the customer 30,000 shillings (approximately 8.5 euros). ”In this work, not a lot of initial assets are needed, and I don’t have to move anywhere, since the customers and their hair come to me,” Daphe smiles. Daphe is Ugandan, and has seven siblings. Before the training, she felt as if there was nothing special about her. After graduating, she plans to work hard and save up the money, in order to be able to open her own hair salon one day. There, in her own business, she could teach young people as well. ”I want to give others the same opportunity to change their life that I’ve been given through the training,” Daphe says. For many young people, school has sparked a needed boost for their self-esteem. For Jonaliese, who escaped from Congo four years ago, the training offered an opportunity to earn more money and start planning her future. If Jonaliese could decide, where would she be in five years’ time? ”I dream of a big business where I could train young refugees and offer them jobs. I want to provide young people with a chance to lead an independent life,” Jonaliese says. Read more about FCA’s work in Uganda.